Stroke and other cerebrovascular diseases are among the most common causes of death worldwide. Prevention of modifiable risk factors is a cost-effective approach to decrease the risk of stroke. Oxidative stress is regarded as the major flexible operative agent in ischemic brain damage. This review presents recent scientific advances in understanding the role of carotenoids as antioxidants in lowering stroke risk based on observational studies. We searched Medline using the following terms: (Carotenoids [MeSH] OR Carotenes [tiab] OR Carotene [tiab] OR “lycopene [Supplementary Concept]” [MeSH] OR lycopene [tiab] OR beta-Carotene [tiab]) AND (stroke [MeSH] OR stroke [tiab] OR “Cerebrovascular Accident” [tiab] OR “Cerebrovascular Apoplexy” [tiab] OR “Brain Vascular Accident” [tiab] OR “Cerebrovascular Stroke” [tiab]) AND (“oxidative stress” [MeSH] OR “oxidative stress”[tiab]). This search considered papers that had been published between 2000 and 2017. Recent studies indicated that high dietary intake of six main carotenoids (i.e., lycopene, <- and ®-carotene, lutein, zeaxanthin, and astaxanthin) was associated with reduced risk of stroke and other cardiovascular outcomes. However, the main mechanism of the action of these nutrients was not identified, and multiple mechanisms except antioxidant activity were suggested to be involved in the observed beneficial effects. The dietary intake of six major carotenoids should be promoted as this may have a substantial positive effect on stroke prevention and stroke mortality reduction. Stroke and other cerebrovascular diseases are the second common leading cause of death in many, especially developing, countries., The burden of stroke is likely to increase as a result of population growth and aging., Despite the high prevalence of stroke, there are limited effective preventive approaches for reducing its burden., The guidelines of the American Heart Association Stroke Council categorises the risk factors for a first stroke as nonmodifiable and modifiable factors., Among the modifiable risk factors, lifestyle modification, such as dietary intake of antioxidants, has long been investigated as a way to decrease the extent of injury caused by an ischemic stroke. A simple and practical approach to healthy food choice might facilitate the primary prevention of stroke by improving nutrition status. Guidelines generally advise a well-balanced diet low in saturated fat and salt, rich in fiber, and high in fruits and vegetables to reduce the incidence of stroke. Oxidative stress, defined as an imbalance between oxygen-free radicals or oxidants and antioxidants, can potentially cause damage to cellular compounds and is thus regarded as the major contributing factor in ischemic brain injury., Therefore, several free-radical scavengers have been proposed as antioxidants to reduce radical loads in cells and the consequent alteration of the redox balance occurring in some pathological conditions such as stroke.,, The development and implementation of efficient strategies for the reduction of the global burden of stroke require a comprehensive understanding of the relationship between dietary antioxidants and the risk of stroke., Since the biochemical pathways triggered by oxidative stress can induce neuronal damage, numerous targets have been recommended for stroke therapy  and modulating the effects of oxidative stress. As a result, the role of carotenoids has attracted growing attention following recommendations to increase the consumption of fruits and vegetables rich in antioxidants. We conducted a comprehensive literature search of the epidemiological studies in Medline (PubMed), Scopus, and Google Scholar databases to identify relevant studies. The electronic search was performed in May 2017. Papers were evaluated if they were published from 2000 up to the present. All titles and abstracts containing the search terms were examined, and full texts were reviewed when necessary. We searched Medline using the following terms: (Carotenoids [MeSH] OR Carotenes [tiab] OR Carotene [tiab] OR “lycopene [Supplementary Concept]” [MeSH] OR lycopene [tiab] OR beta-Carotene [tiab]) AND (stroke [MeSH] OR stroke [tiab] OR “Cerebrovascular Accident” [tiab] OR “Cerebrovascular Apoplexy” [tiab] OR “Brain Vascular Accident” [tiab] OR “Cerebrovascular Stroke” [tiab]) AND (“oxidative stress” [MeSH] OR “oxidative stress” [tiab]). 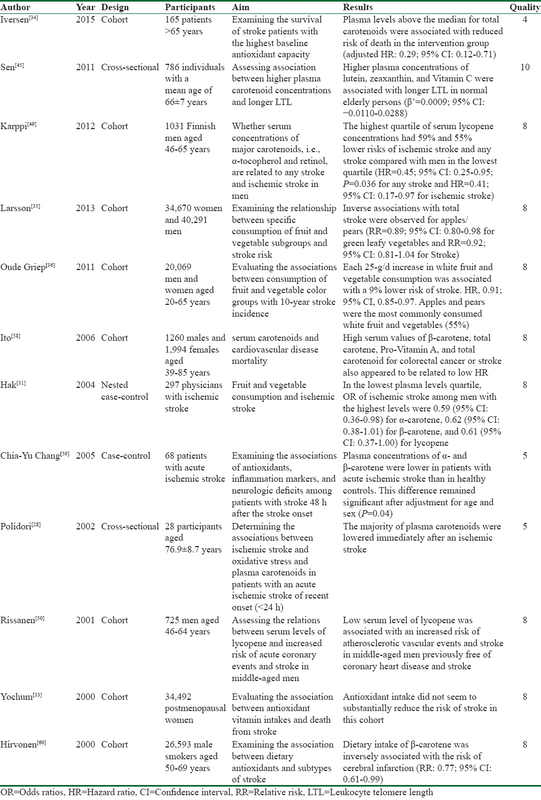 The identified studies were only included in this review if they offered new insights or opinions and investigated responses to the consumption of different types of carotenoids or clearly assessed the effects of dietary carotenoids, i.e., lutein, zeaxanthin, β-cryptoxanthin, and astaxanthin, and their serum concentrations on stroke prevention or stroke mortality. Only English articles were evaluated. The studies were only reviewed if their full text or abstract was available. The studies were excluded if they (1) were not related to the carotenoids-stroke association; (2) did not clearly explain the effects of carotenoids on each type of stroke; (3) were case reports, case series, communication letters, posters of conferences, and protocols; and (4) were conducted on animals or in vitro. [Figure 1] shows the flowchart of the study selection phase. 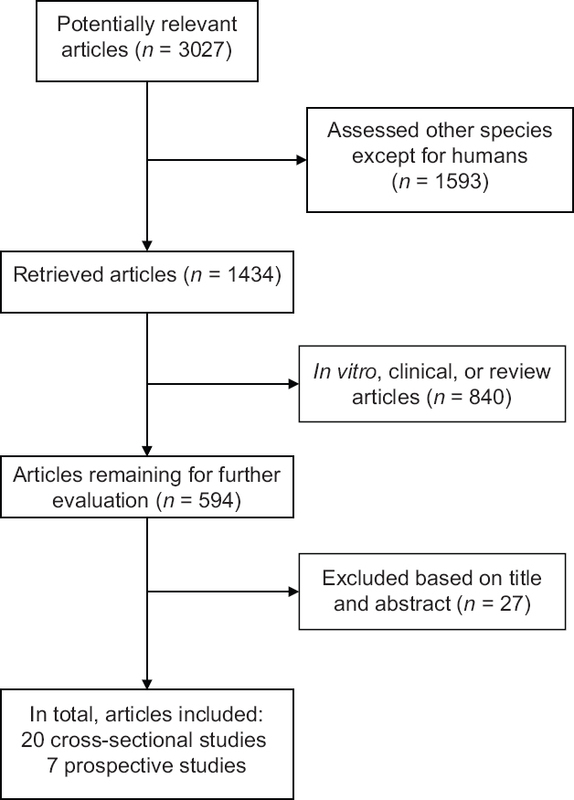 For each paper, two researchers independently extracted the required information including the first author's name, sample size, participants' age, study design, duration of follow-up (for prospective studies), study objectives, context of the study, and the effects of carotenoids on the outcomes. We did not exclude any low-quality papers because we wanted to help our readers to get a complete understanding of all research in this field. The Newcastle-Ottawa scale was used to assess the quality of cohort and case–control studies. The results of quality assessments and the characteristics of the selected studies are listed in [Table 1]. Carotenoids are some of the most vital colored phytochemicals responsible for the yellow to red color of some fruits and vegetables. Known as lipophilic antioxidant vitamins, carotenoids are found in the human diet, particularly in fruits and vegetables. Owing to their nutritional benefits, carotenoids and their isomers play an important role in protecting cells from oxidation and cellular damages and maintaining good health., Recent research on carotenoids has focused on their potent antioxidant properties and their role in preventing the incidence of human diseases such as cancer, cardiovascular diseases, osteoporosis, and diabetes. Some cohort studies also attempted to establish associations between lower plasma carotenoid concentrations or carotenoids intake and higher risk of stroke. Many studies have documented inverse associations between all types of stroke and plasma values or carotenoids intake.,, However, one study on postmenopausal women did not find substantial reductions in the risk of stroke. Iversen et al. detected a relationship between serum concentrations of total carotenoids and survival of ischemic stroke. This cohort included 165 patients aged above 65 years admitted to hospital for acute stroke. The authors found that plasma levels above the median for total carotenoids were associated with reduced risk of death with adjusted hazard ratio of 0.29 (95% confidence interval [CI]: 0.12–0.71). Other research regarding fruit and vegetables intake identified inverse associations between high apples/pears intake and total stroke (relative risk [RR]: 0.89; 95% CI: 0.80–0.98; P for trend = 0.02). Each 25 g/day increase in white fruit and vegetables, for example, apples/pears, consumption was associated with 9% reduction in the risk of stroke., Therefore, recommendations to consume apples or Pears are consistent with the mentioned research. The various carotenoids in these foods are believed to be responsible for their antioxidant properties and may be involved in the prevention of chronic diseases.,, These findings suggest that the majority of plasma carotenoids are lowered immediately after an ischemic stroke, perhaps as a result of increased oxidative stress, as indicated by a concomitant rise in malondialdehyde concentrations. In fact, antioxidant activity of plasma may be an important factor in protection from neurological damage caused by stroke-associated oxidative stress, The antioxidants are consumed or oxidized during the cerebral process before the stroke so their levels of antioxidants are lower before the stroke. Therefore, considering conjugated double bonds, combined therapy using antioxidants might be effective in the acute and convalescent stages of stroke. [Table 1] provides a summary of the selected studies. β-carotene is an efficient quencher of singlet oxygen and comprises several isomers (i.e., all trans and 9-cis β-carotene) capable of inhibiting the oxidative stress and decreasing neuronal damage. Some research on stroke-prone spontaneously hypertensive rats (SHRs) demonstrated that β-carotene significantly enhanced the expression levels of genes related to cholesterol regulation, including apo E, and promoted neuronal repair after brain injuries. Sansawa et al. focused on the beneficial effects of serum values of β-carotene on mortality rates in a population-based follow-up study of 3254 participants. During the 11.7 years of follow-up, high serum values of β-carotene and total carotene appeared to be related with low hazard ratios for colorectal cancer or stroke. Another study conducted a prospective, nested case–control analysis on male physicians with and without diagnosed cardiovascular diseases. It found that plasma levels of α- and β-carotenes were inversely related to the stroke risk. Despite these positive results, a prospective observational study reported that Vitamins C and E and β-carotene did not have protective effects on stroke risk  Similarly, Leppälä et al. investigated the effects of β-carotene supplementation on the risk of stroke in 28,519 male cigarette smokers aged 50–69 years without a history of stroke who participated in the Alpha-tocopherol, beta carotene cancer prevention (ATBC) study. The participants were supplemented with 20 mg/day β-carotene or placebo and followed up for a median duration of 6 years. The results showed that β-carotene supplementation increased the risk of intracerebral hemorrhage by 62% (95% CI: 10%–136%; P = 0.01). However, no obvious mechanism was detected. Meanwhile, the 6-year postintervention evaluations indicated that β-carotene supplementation had no effects on stroke and its subtypes (RR: 0.97; 95% CI: 0.86–1.09). These conflicting results may be due to differences in the conduct of trials as human trials were performed by administering a synthetic all-trans β-carotene whose dose was higher than the β-carotene content of fruits and vegetables. Only a few studies systematically examined the impact of other subtypes of carotenoids on the incidence of stroke. Thus, a specific reduction in stroke risk for single subgroups of carotenoids still needs to be interpreted with caution. In a prospective, nested case–control study, called the Physicians' Health Study, 297 male physicians were followed up for up to 13 years. Levels of five major carotenoids (α- and β-carotene, β-cryptoxanthin, lutein, and lycopene), retinol, and α- and γ-tocopherol were measured in participants with ischemic stroke and paired controls. The multivariate adjusted odds ratios of ischemic stroke among men with the highest levels were 0.59 (95% CI: 0.36–0.98) for α-carotene, 0.62 (95% CI: 0.38–1.01) for β-carotene, and 0.61 (95% CI: 0.37–1.00) for lycopene. A prospective study of the relations between baseline plasma levels of β-cryptoxanthin and tocopherols and the risk of ischemic stroke indicated the absence of an inverse association between β-cryptoxanthin and ischemic stroke. A cross-sectional cohort study confirmed these findings. Dietary lycopene is mainly obtained from tomatoes and tomato-based products. Lycopene is the most potent antioxidant among plasma carotenoids. Although the antioxidant properties of lycopene are thought to be primarily responsible for its beneficial effects, other mechanisms such as hormonal and immune system modulations are also suggested., Many studies have highlighted associations between serum concentrations of lycopene and decreased risk of all types of stroke and ischemic stroke. Furthermore, in a prospective, nested case–control study performed on 297 physicians suffering from ischemic stroke, baseline plasma levels of α- and β-carotene and lycopene tended to be inversely related with the risk of ischemic stroke and had an apparent threshold effect compared to controls. A study on the association of major carotenoids, i.e., α-tocopherol, retinol, and lycopene, with ischemic stroke in 1031 Finnish men aged 46–65 years found that the highest quartile of serum lycopene concentrations had 59% and 55% lower risks of ischemic stroke and any stroke, respectively. These results support the results previously reported by Rissanen et al. who conducted a cohort study on 725 middle-aged men. Lutein and zeaxanthin are xanthophyll carotenoids found particularly in dark-green leafy vegetables and egg yolk. They are widely distributed in tissues and are the principal carotenoids in the eye lens and macular region of the retina. Recent studies have suggested that lutein and zeaxanthin contribute to the prevention of heart disease and stroke. In a cross-sectional cohort study, Sen et al. demonstrated that higher plasma concentrations of lutein, zeaxanthin, and Vitamin C were associated with longer leukocyte telomere length in normal elderly persons. They concluded that these antioxidants had a protective role in telomere maintenance in elderly adults with a mean age of 66 ± 7 years. Another study investigated the protective role of lutein in cerebral ischemic/reperfusional (I/R) injury in a mouse model of ischemic stroke. The results indicated higher survival rate, better neurological scores, smaller infarct area, and smaller infarct volume in the lutein-treated group after lutein (0.2 mg/kg) intake. Therefore, lutein could diminish the deleterious outcomes of cerebral I/R and may be used as a potential treatment for stroke patients. Moreover, due to their extra conjugated double bond, some types of carotenoids such as zeaxanthin are believed to be potent antioxidants and facilitate the protection of brain tissue from oxidative damages. As the evidence for the role of lutein and zeaxanthin in disease prevention continues to evolve, particularly from human studies directed to their bioavailability, metabolism, and dose-response relationships with intermediary biomarkers and clinical outcomes, it is noteworthy that recommendations to consume foods rich in xanthophylls are consistent with current dietary guidelines. The ketocarotenoid astaxanthin is the main carotenoid present in aquatic animals (salmon, trout, red sea bream, shrimp, and lobster) and contributes to the pinkish-red color of their flesh. It is also present in some birds (particularly flamingoes and quails). Astaxanthin is biosynthesized by microalgae and phytoplankton. The highest levels of this carotenoid in nature were found in Chlorophyte alga Haematococcus pluvialis., A previous study hypothesized that astaxanthin had antithrombotic and antihypertensive effects and exhibited noticeable neuroprotection against brain damage induced by I/R which could partly be attributed to its antioxidant activity. An experimental study by Lu et al. investigated the neuroprotective effects of astaxanthin on oxidative stress-induced toxicity in primary culture of cortical neurons and on focal cerebral I/R-induced brain damage in rats. They found that pretreatment with intragastric astaxanthin 5 and 1 h before ischemia dramatically decreased the infarct volume and improved neurological deficit in a dose-dependent manner. In another study, oral administration of astaxanthin-O (50 mg/kg) for 5 weeks induced a significant reduction in arterial blood pressure and delayed the incidence of stroke in SHRs. These antihypertensive effects of astaxanthin-O might have been caused by an NO-related mechanism. While many epidemiological studies have reported the promising effects of the five major carotenoids (i.e., lycopene, α- and β-carotene, lutein, and zeaxanthin) on the reduction of stroke risk, we did not find any clinical trials of carotenoid administration either among healthy people for the reduction of stroke risk or among stroke survivors for the reduction of stroke mortality and morbidity. Moreover, there are still many unanswered questions about the contribution of individual carotenoids to the risk of stroke. Likewise, the main mechanism of stroke risk reduction by carotenoids and the effects of carotenoids on stroke-related complications are still unknown. Singh R, Suh I, Singh V, Chaithiraphan S, Laothavorn P, Sy R, et al. Hypertension and stroke in Asia: prevalence, control and strategies in developing countries for prevention. Journal of human hypertension. 2000;14(10/11):749. Teo K, Lear S, Islam S, Mony P, Dehghan M, Li W, et al. Prevalence of a healthy lifestyle among individuals with cardiovascular disease in high-, middle-and low-income countries: the Prospective Urban Rural Epidemiology (PURE) study. Jama. 2013;309(15):1613-21. Feigin VL. Stroke in developing countries: can the epidemic be stopped and outcomes improved? The Lancet Neurology. 2007;6(2):94-7. Oveisgharan S, Ghaemmaghami AB, Bahonar A, Sarrafzadegan N. Case fatality rate↱ and disability of stroke in↱ Isfahan, Iran: Isfahan stroke registry. Iranian Journal of Neurology. 2016;15(1):9–15. Khosravi A, Tabib AA, Golshadi I, Siadat ZD, Bahonar A, Zarfeshani S, et al. The relationship between weight and CVD risk factors in a sample population from central Iran (based on IHHP). ARYA atherosclerosis. 2012;8(2):82. Goldstein LB, Bushnell CD, Adams RJ, Appel LJ, Braun LT, Chaturvedi S, et al. Guidelines for the primary prevention of stroke a guideline for healthcare professionals from the American Heart Association/American Stroke Association. Stroke. 2011;42(2):517-84. Yeganehkhah M, Mohammady-Shahbalagy F, Khankeh H, Rahgozar M. The effect of slow stroke back massages on anxiety, primigravid women. Iran Journal of Nursing. 2008;21(54):73-83. Shirley R, Ord EN, Work LM. Oxidative stress and the use of antioxidants in stroke. Antioxidants. 2014;3(3):472-501. Goldstein LB, Bushnell CD, Adams RJ, Appel LJ, Braun LT, Chaturvedi S, et al. Guidelines for the primary prevention of stroke. Stroke. 2011;42(2):517-84. Chen H, Yoshioka H, Kim GS, Jung JE, Okami N, Sakata H, et al. Oxidative stress in ischemic brain damage: mechanisms of cell death and potential molecular targets for neuroprotection. Antioxidants & redox signaling. 2011;14(8):1505-17. Slemmer JE, Shacka JJ, Sweeney M, Weber JT. Antioxidants and free radical scavengers for the treatment of stroke, traumatic brain injury and aging. Current medicinal chemistry. 2008;15(4):404-14. Behl C, Moosmann B. Oxidative nerve cell death in Alzheimers disease and stroke: antioxidants as neuroprotective compounds. Biological chemistry. 2002;383(3-4):521-36. Taghiyar M, Ghiasvand R, Feizi A, Askari G, Shokri N. Effects of Vitamins C and E Supplementation on Muscle Damage and Oxidative Stress in Female Athletes: A Double-Blind Clinical Trial. Journal of Isfahan Medical School. 2013;30(216): 2113-2124. Hankey GJ. Nutrition and the risk of stroke. The Lancet Neurology. 2012;11(1):66-81. Medeiros F, Casanova MdA, Fraulob JC, Trindade M. How can diet influence the risk of stroke? International journal of hypertension. 2012;2012:1-7. Broughton BR, Reutens DC, Sobey CG. Apoptotic mechanisms after cerebral ischemia. Stroke. 2009;40(5):e331-e9. Mashhadi NS, Ghiasvand R, Askari G, Hariri M, Darvishi L, Mofid MR. Anti-oxidative and anti-inflammatory effects of ginger in health and physical activity: review of current evidence. International journal of preventive medicine. 2013;4: S36-42. Arscott SA, Tanumihardjo SA. Carrots of many colors provide basic nutrition and bioavailable phytochemicals acting as a functional food. Comprehensive reviews in Food Science and Food Safety. 2010;9(2):223-39. Humphries JM, Khachik F. Distribution of lutein, zeaxanthin, and related geometrical isomers in fruit, vegetables, wheat, and pasta products. Journal of Agricultural and Food Chemistry. 2003;51(5):1322-7. Khoo H-E, Prasad KN, Kong K-W, Jiang Y, Ismail A. Carotenoids and their isomers: color pigments in fruits and vegetables. Molecules. 2011;16(2):1710-38. Mashhadi NS, Ghiasvand R, Hariri M, Askari G, Feizi A, Darvishi L, et al. Effect of ginger and cinnamon intake on oxidative stress and exercise performance and body composition in Iranian female athletes. International journal of preventive medicine. 2013;4: :S31-5..
Rao AV, Rao LG. Carotenoids and human health. Pharmacological research. 2007;55(3):207-16. Agarwal S, Rao AV. Tomato lycopene and its role in human health and chronic diseases. Canadian Medical Association Journal. 2000;163(6):739-44. Ciccone MM, Cortese F, Gesualdo M, Carbonara S, Zito A, Ricci G, et al. Dietary intake of carotenoids and their antioxidant and anti-inflammatory effects in cardiovascular care. Mediators of inflammation. 2013;2013:1-12. Dhankhar J, Kadian SS, Sharma A. Astaxanthin: A potential carotenoid. International Journal of Pharmaceutical Sciences and Research. 2012;3(5):1246. Polidori MC, Cherubini A, Stahl W, Senin U, Sies H, Mecocci P. Plasma carotenoid and malondialdehyde levels in ischemic stroke patients: relationship to early outcome. Free radical research. 2002;36(3):265-8. Leinonen JS, Ahonen J-P, Lönnrot K, Jehkonen M, Dastidar P, Molnár G, et al. Low plasma antioxidant activity is associated with high lesion volume and neurological impairment in stroke. Stroke. 2000;31(1):33-9. Ascherio A, Rimm EB, Hernán MA, Giovannucci E, Kawachi I, Stampfer MJ, et al. Relation of consumption of vitamin E, vitamin C, and carotenoids to risk for stroke among men in the United States. Annals of Internal Medicine. 1999;130(12):963-70. Hak AE, Ma J, Powell CB, Campos H, Gaziano JM, Willett WC, et al. Prospective study of plasma carotenoids and tocopherols in relation to risk of ischemic stroke. Stroke. 2004;35(7):1584-8. Joshipura KJ, Ascherio A, Manson JE, Stampfer MJ, Rimm EB, Speizer FE, et al. Fruit and vegetable intake in relation to risk of ischemic stroke. Jama. 1999;282(13):1233-9. Yochum LA, Folsom AR, Kushi LH. Intake of antioxidant vitamins and risk of death from stroke in postmenopausal women. The American Journal of Clinical Nutrition. 2000;72(2):476-83. Iversen PO, Ha L, Blomhoff R, Hauge T, Veierød MB. Baseline oxidative defense and survival after 5–7 years among elderly stroke patients at nutritional risk: Follow-up of a randomized, nutritional intervention trial. Clinical Nutrition. 2015;34(4):775-8. Larsson SC, Virtamo J, Wolk A. Total and specific fruit and vegetable consumption and risk of stroke: a prospective study. Atherosclerosis. 2013;227(1):147-52. Griep LO, Verschuren WM, Kromhout D, Ocké MC, Geleijnse JM. Raw and processed fruit and vegetable consumption and 10-year stroke incidence in a population-based cohort study in the Netherlands. European journal of clinical nutrition. 2011;65(7):791-9. Delpino-Rius A, Eras J, Marsol-Vall A, Vilaró F, Balcells M, Canela-Garayoa R. Ultra performance liquid chromatography analysis to study the changes in the carotenoid profile of commercial monovarietal fruit juices. Journal of Chromatography A. 2014;1331:90-9. Boyer J, Liu R. Apple phytochemicals and their health benefits. Nutrition journal. 2004;3(1):1-15. Zheng J, Rautiainen S, Morgenstern R, Wolk A. Relationship between plasma carotenoids, fruit and vegetable intake, and plasma extracellular superoxide dismutase activity in women: different in health and disease? Antioxidants & redox signaling. 2011;14(1):9-14. Sachindra NM, Sato E, Maeda H, Hosokawa M, Niwano Y, Kohno M, et al. Radical scavenging and singlet oxygen quenching activity of marine carotenoid fucoxanthin and its metabolites. Journal of agricultural and food chemistry. 2007;55(21):8516-22. Yamagata K, Nakayama C, Suzuki K. Dietary β-carotene regulates interleukin-1β-induced expression of apolipoprotein E in astrocytes isolated from stroke-prone spontaneously hypertensive rats. Neurochemistry international. 2013;62(1):43-9. Sansawa H, Takahashi M, Tsuchikura S, Endo H. Effect of chlorella and its fractions on blood pressure, cerebral stroke lesions, and life-span in stroke-prone spontaneously hypertensive rats. Journal of nutritional science and vitaminology. 2006;52(6):457-66. Group HPSC. MRC/BHF heart protection study of antioxidant vitamin supplementation in 20,536 high-risk individuals: a randomized placebo-controlled trial. ACC Current Journal Review. 2002;11(6):39-40. Leppälä JM, Virtamo J, Fogelholm R, Huttunen JK, Albanes D, Taylor PR, et al. Controlled trial of α-tocopherol and β-carotene supplements on stroke incidence and mortality in male smokers. Arteriosclerosis, Thrombosis, and Vascular Biology. 2000;20(1):230-5. Sen A, Marsche G, Freudenberger P, Schallert M, Toeglhofer AM, Nagl C, et al. Association between higher plasma lutein, zeaxanthin, and vitamin C concentrations and longer telomere length: results of the Austrian Stroke Prevention Study. Journal of the American Geriatrics Society. 2014;62(2):222-9. Rao A, Ray M, Rao L. Lycopene. Advances in food and nutrition research. 2006;51:99-164. Li S-Y, Yang D, Fu ZJ, Woo T, Wong D, Lo ACY. Lutein enhances survival and reduces neuronal damage in a mouse model of ischemic stroke. Neurobiology of disease. 2012;45(1):624-32. Karppi J, Laukkanen JA, Sivenius J, Ronkainen K, Kurl S. Serum lycopene decreases the risk of stroke in men A population-based follow-up study. Neurology. 2012;79(15):1540-7. Rissanen TH, Voutilainen S, Nyyssönen K, Lakka TA, Sivenius J, Salonen R, et al. Low serum lycopene concentration is associated with an excess incidence of acute coronary events and stroke: the Kuopio Ischaemic Heart Disease Risk Factor Study. British Journal of Nutrition. 2001;85(06):749-54. Heber D, Lu Q-Y. Overview of mechanisms of action of lycopene. Experimental Biology and Medicine. 2002;227(10):920-3. Xinli L, Jiuhong X. Dietary and circulating lycopene and stroke risk: a meta-analysis of prospective studies. Scientific reports. 2014;4:5031. Deshpande J, Shankaranarayanan J. Neuroprotective effect of carotenoids in brain. Google Patents; 2014:595. Ribaya-Mercado JD, Blumberg JB. Lutein and zeaxanthin and their potential roles in disease prevention. Journal of the American College of Nutrition. 2004;23(sup6):567S-87S. Sasaki Y, Kobara N, Higashino S, Giddings JC, Yamamoto J. Astaxanthin inhibits thrombosis in cerebral vessels of stroke-prone spontaneously hypertensive rats. Nutrition Research. 2011;31(10):784-9. Lu Y-P, Liu S-Y, Sun H, Wu X-M, Li J-J, Zhu L. Neuroprotective effect of astaxanthin on H 2 O 2-induced neurotoxicity in vitro and on focal cerebral ischemia in vivo. Brain research. 2010;1360:40-8. Hussein G, Nakamura M, Zhao Q, Iguchi T, Goto H, Sankawa U, et al. Antihypertensive and neuroprotective effects of astaxanthin in experimental animals. Biological and Pharmaceutical Bulletin. 2005;28(1):47-52. Ito Y, Suzuki K, Ishii J, Hishida H, Tamakoshi A, Hamajima N, et al. A population-based follow-up study on mortality from cancer or cardiovascular disease and serum carotenoids, retinol and tocopherols in Japanese inhabitants. Asian Pacific Journal of Cancer Prevention. 2006;7(4):533. Chang C-Y, Chen J-Y, Ke D, Hu M-L. Plasma levels of lipophilic antioxidant vitamins in acute ischemic stroke patients: correlation to inflammation markers and neurological deficits. Nutrition. 2005;21(10):987-93. Hirvonen T, Virtamo J, Korhonen P, Albanes D, Pietinen P. Intake of flavonoids, carotenoids, vitamins C and E, and risk of stroke in male smokers. Stroke. 2000;31(10):2301-6.